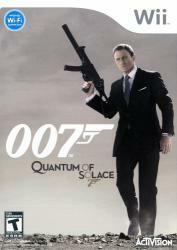 James Bond is back to settle the score in the Quantum of Solace� game. Introducing a more lethal and cunningly efficient Bond, the game blends intense first-person action with a unique third-person cover combat system that allows players to truly feel what it is like to be the ultimate secret agent as they use their stealth, precision shooting and lethal combat skills to progress through missions. Seamlessly blending the heart-pounding action and excitement of the upcoming �Quantum of Solace� feature film with the �Casino Royale� movie, the title propels players into the cinematic experience of international espionage.